Overhead line insulators are used for transmission, distribution lines and electrical traction lines. The design may be different for each application and the product range is wide depending on the dimensional, mechanical and electrical requirements. Typical insulator types in this category are guy-strain insulators, pin type insulators, composite line post insulators, long-rod insulators for tension and suspension and glass suspension insulators. Other types may be insulators for electrical traction lines such as for railways. Materials may be porcelain or composite. Line post composite insulator designs for 12-36kV are all made of glass fibre rod with HTV silicone housing and forged aluminium end fittings. We have a wide selection of types for different applications. The insulators come with a base pin-, flange- and top fitting for conductor ties, clamps or flange. For this product category, we have developed a special top-clamp with “built-in” wheels for easy stringing of conductors. The clamp adopts most of the standard conductor sizes for distribution lines and is designed for live line working as well. Composite railway insulators for catenary systems. Cantilever and tension types, all with forged aluminium end fittings specially designed for catenary systems. Other composite line, post insulators on demand. Composite suspension insulators on demand. Materials according to C110 – Siliceous porcelain or C120 – Alumina porcelain glaze colours: Brown RAL 8017 or ANSI 70 grey. Pin insulators 12-36kV – NTP standard types 12,5kN bending strength. Tie-top head of insulator with semi-conductive glaze. Fitted with zinc thimble for 1” pin threads. 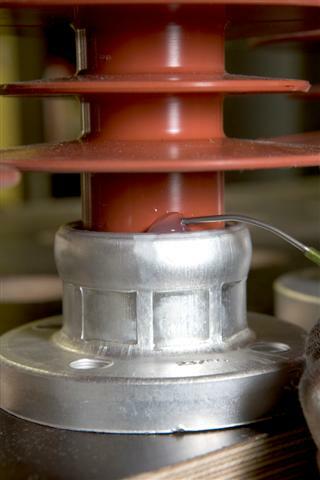 Insulators to other standards on demand. Insulators to IEC or ANSI Standard. Pin and schackel insulators for low voltage lines. 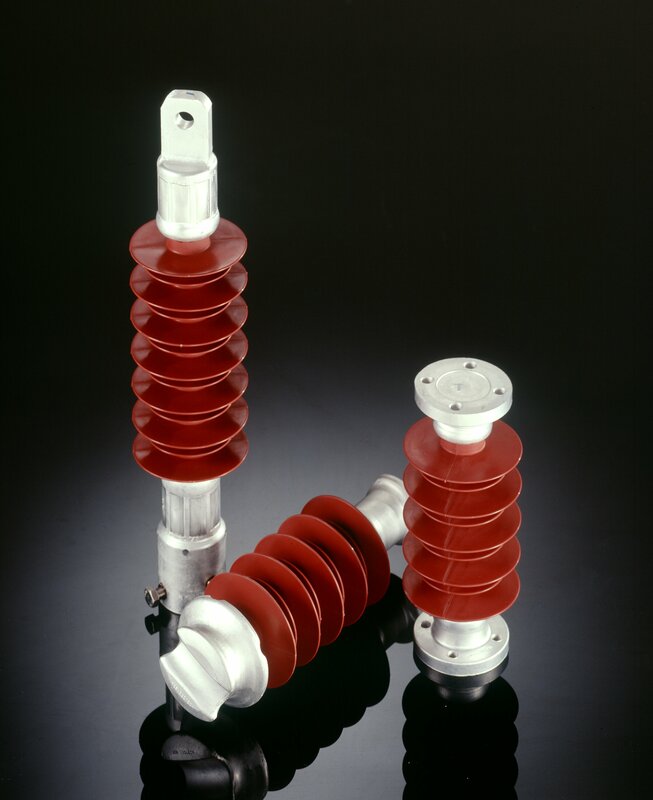 Porcelain pin and line-post insulators, guy strain and schackel insulators for different applications and voltages. Composite line-post and post insulators for distribution lines and railway catenary systems. Silicone sheds and aluminium end fittings. 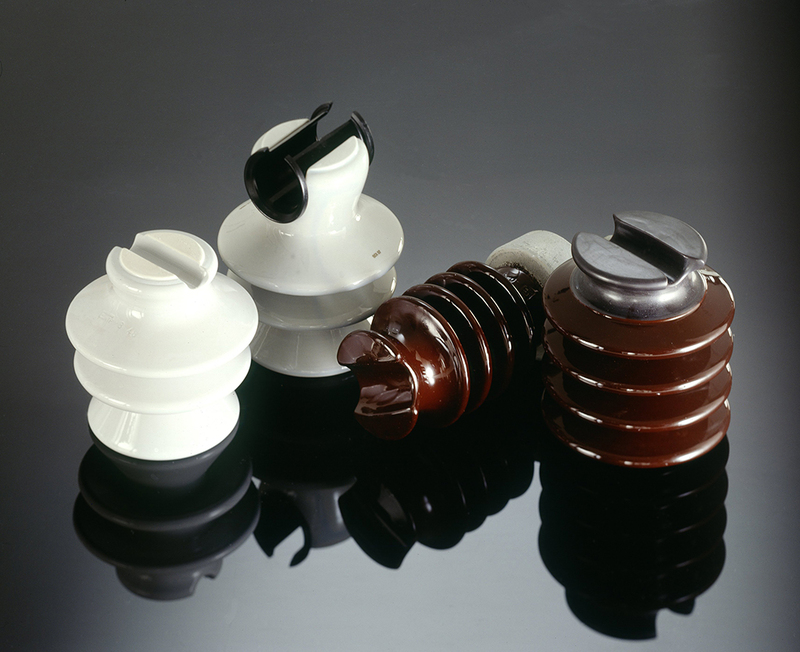 All composite insulator types are tested according to the relevant standard for each product category.